1 skein Red Heart Super Saver red, orange, yellow, green, blue, violet, and purple. Ripple Block Afghan: This afghan does not require any sewing, but it does require the first row of triangular blocks to be made one at a time, with the yarn cut at the end of one block and rejoined to begin the next block. Once the first row is done, the rest is worked with no cutting of yarn, except to change colors. For the color scheme, I used red for the bottom starting blocks row (for 8 blocks). 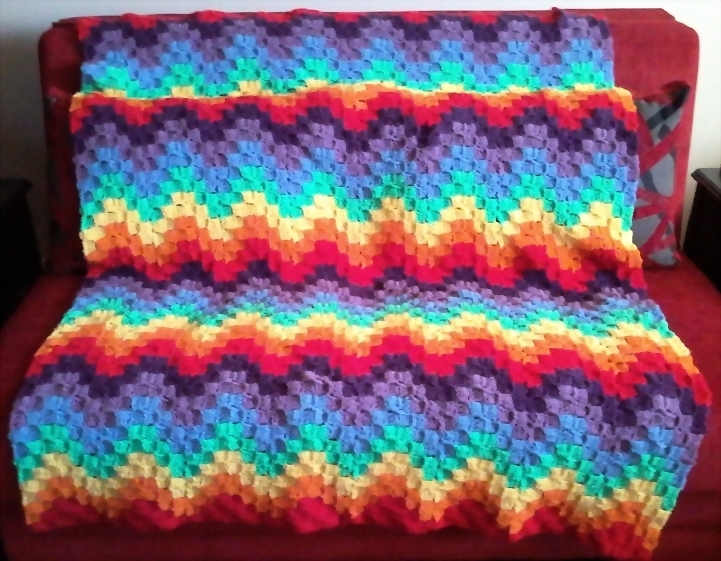 The rest of the afghan is worked in 2 rows of orange, yellow, green, blue, violet, and purple, where the colors repeat again starting with red. I used 4 repetitions of the colors, ending with the first, red, color. The afghan measures approximately 50 x 60 inches. It has a nice texture with an almost pixelated look to it. I have made diagrams for the first row of blocks. These diagrams are different color blocks just to highlight them, but they should be worked in one color only. There are 2 diagrams, one for the very first block, and one for the joining adjacent blocks. The second block is then repeated until desired width of afghan is achieved. When working on the blocks, you will be turning the work here and there, so be sure to have the work on the right side when referencing the diagrams. (1) Ch 7, DC in 4th ch from hook and in next 3 chains. (2) Ch 3, 3 DC around post of last (4th) DC on 1st block. (3) Ch 6, turn, DC in 4th ch from hook and in next 2 chains. Join with a SlSt to 2nd block at top ch 3 space. (4) Ch 3, 4 DC around ch 3 post of 2nd block below. (5) Ch 3, 3 DC around post of 4th DC of block 4. Join with a SlST around post of ch 3 space of block 3. (6) Ch 3, 3 DC around ch 3 post of block 3. (7) Ch 6, DC in 4th ch from hook and in next 2 chains. Join with a SlSt to ch 3 space at top of block 6. (8) Ch 3, 3 DC around ch 3 post of block 6. Join with a SlSt to ch 3 space of block 5. (9) Ch 3, 4 DC around ch 3 post of block 6. (10) Ch 3, 3 DC around post of 4th DC of block 9. Join with a SlSt to ch 3 space of block 4. (11) Ch 3, 3 DC around ch 3 post of block 4. Join with a SlSt to ch 3 space of block 1. (12) Ch 3, 3 DC around ch 3 post of block 1. Place work so that the ch 3 space of block 7 of starting block is on the left. Attach yarn to right side of this ch 3 space (in block 7 of starting block). (1) Ch 3, 3 DC in ch 3 space. (weave end toward the straight edge under the DC stitches). (2) Ch 6, DC in 4th ch from hook and in next 2 chains. Join with a SlSt to ch 3 space at top of block 1. (3) Ch 6, DC in 4th ch from hook and in next 2 chains. Join with a SlSt to ch 3 space at top of block 2. (4) Ch 3, 3 DC in ch 3 space of block 2. (5) Ch 6, DC in 4th ch from hook and in next 2 chains. Join with a SlSt to ch 3 space at top of block 4. (6) Ch 3, 3 DC in ch 3 space at top of block 3. (7) Ch 6, turn, DC in 4th ch from hook and in next 2 chains. Join with a SlSt to ch 3 space at top of block 6. (8) Ch 3, 3 DC in ch 3 space of block 6. Join with a SlSt to ch 3 space of block 5. (9) Ch 3, 3 DC in ch 3 space of block 5. (10) Ch 6, DC in 4th ch from hook and in next 2 chains. Join with a SlSt to ch 3 space at top of block 9. (11) Ch 3, 3 DC in ch 3 space of block 9. Join with a SlSt to ch 3 space at top of block 8. (12) Ch 3, 3 DC in ch 3 space of block 8. Join with a SlSt to ch 3 space at top of block 7. Repeat Joining Blocks until desired width. Starting at the first block (block 12 of Starting Block), attach orange yarn to the ch 3 space at the top of the first block. (1) Ch 3, 3 DC in ch 3 space. Join with a SlSt to ch 3 space at top of block next to it (to the left). (2) Ch 3, 3 DC in same ch 3 space as SlSt. Join with a SlSt to top of block next to it. (3) (Corner blockss) Ch 3, 4 DC in same Ch 3 space as SlSt. (4) Ch 3, 3 DC around post of 4th DC of block just made. Join with a SlSt to ch 3 space along side of block just beneath it. 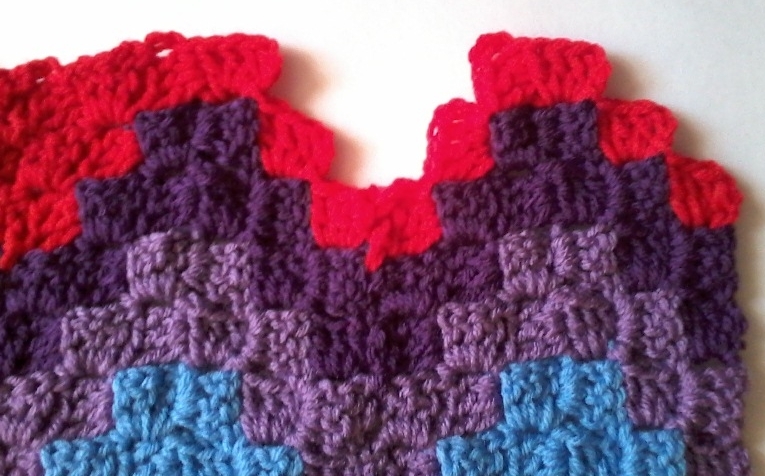 (Corner squares completed). (5) Ch 3, 3 DC in same Ch 3 space as SlSt. Join with a SlSt to ch 3 space of block beneath it. (6) Ch 3. 3 DC in same Ch 3 space as SlSt. Join with a Slst to Ch 3 space of block beneath it (in row of blocks beneath it). (7) Ch 3, turn work, SlSt into Ch 3 space at top of block just made. Turn work again. 3 DC in Ch 3 space or row beneath the empty space. Join with a SlSt to next block. Repeat pattern, (2)-(7), working in 2 rows of each color, work first row across the row to the end, ending with a SlSt in Ch 3 space of last block. Second row of color: Ch 1 turn. SlSt across first 3 DC and into ch 3 space at top of block. Ch 3, 3 DC in ch 3 space. Continue in pattern to end of row. Cut yarn. Change Color. Repeat pattern to desired length. 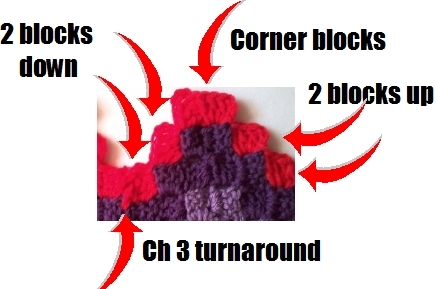 Read Final Blocks section before you complete the final rows of color. This pattern can cause confusion if you are focusing on one block at a time while working on it (making it easy to add unnecessary blocks). It is much easier if you think of the pattern as 2 blocks up, a corner block, and 2 blocks down, with the ch 3 turnaround in between the blocks down and blocks up. I began and ended with red yarn. To make this section match the starting rows in terms of size and pattern, Complete the first row as usual, then cut yarn. 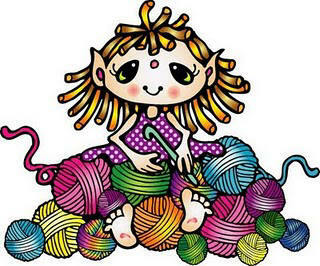 You will have spaces to fill in with your last color of yarn. To fill in the spaces along the top, attach yarn to a ch 3 space along the side of a corner block section. Ch 3, 3 DC in same ch 3 space, SlSt into Ch 3 space of block below. Ch 3, 3 DC in same Ch 3 space, SlSt into center space of 2 blocks below. Ch 3, turn work, SlSt into Ch 3 space of block just made. Turn work. 3 DC in Ch 3 space of block below. SlSt into Ch 3 space of next block. Ch 3, 3 DC in same Ch 3 space. Slst into Ch 3 space of block next to it. Ch 1, turn. Slst across 3 DC and into the Ch 3 space. Ch 3, 3 DC in same Ch 3 space, Slst into space between blocks below. Ch 3, turn work. Slst into Ch 3 of block just made. Turn work. 3 DC into Ch 3 space. Slst st into Ch 3 space of block next to it. Cut yarn. Finish corner sections in same manner.